Here at Midland Handling Equipment, we provide a wide variety of different free track conveyor belts and systems. Our range consists of 3 different types of Trakmaster Series along with various carriers, components and steelwork to create a bespoke system for your company. Having a Free Track in your factory or warehouse is an excellent low-cost solution to any handling problems. It basically consists of a trolley style carrier running through a track section powered either by gravity or hand. Our range of carriers varies from manual rotators, indexers and sprocket rotators, and can be applied to trolleys or load bars. Free Track conveyors are versatile in what they can hold for example the Trackmaster 152FT consists of a 37.5kg capacity with a four-wheel trolley above hooks to hang various object and materials. Hanging products means there’s extra floor space and room for moving material. Along with the hook application, we also provide different carriers to suit different load types making our systems even more versatile. For even more flexibility we provide Free Track systems with eight-wheeled trolleys, like our Trackmaster 406FT. Our high-quality conveyors mean we extend the life of your conveyor system and prevent damage, and therefore you have a long-term cost-saving solution. Midland Handling Equipment offers you an easy solution as we understand that the flow of your business can come to a halt due to faulty equipment and materials which is why we only provide companies with the very best conveyor systems. If you would like more information or if you have any queries on our Free Track Series, Belt or Power Rollers, Power Free or any of our products get in touch with us. Free track systems are an easy and low-cost approach to solving handling problems in your factory. We offer a variety of free track systems, carriers and steel work that can be customised to meet the demands of our clients. Variety – we offer a range of three different Trakmaster series that come with different components and carriers. From these, we can make bespoke designs and carrier systems that fit perfectly with your company. The free track conveyors have different weight capacity depending on the length of the track and the number of wheel trolleys. High-quality guarantee – we take the sturdiness and durability of our systems very seriously. We use the highest quality materials in the production process to prevent damage and extend the life of the systems. As a result, our clients are able to save significantly on the long-term use of the systems. 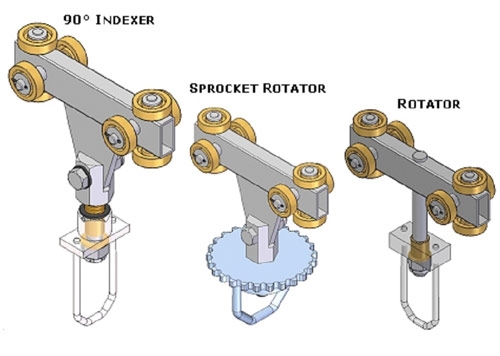 Readily available extras – to make our systems more adaptable to your factory, we offer a wide range of extras for your conveyor system like a Track Switch and a turntable among other extras. All our systems also have an accessible position in the circuit for easier and safety inspection and maintenance. Our Trackmaster 152FT consists of a 4 wheeled trolley with a load capacity of up to 37.5Kg. 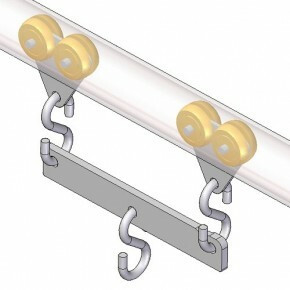 It runs through a high-quality mild steel tubular track section which is 41mm o/d and has a 3mm wall thickness. Trolleys can be doubled up over a load bar to take greater loads up to 70Kg, depending on product dimensions. Special trolleys can be designed to suit the shape of the track and they’re manually pushed through the layout of the track. There are plenty of extras to add to your conveyor system to suit your warehouse or factory. A Track switch will allow diversion of loads to different lines whether that is into storage or to feed a workstation. We make sure your system is easy to inspect by incorporating it in a readily accessible position in your circuit for maintenance. If you need to change the direction of your trollies or load bars then we offer a turntable as a solution. We provide single and double turntables with a centre to suit your application. Click here to download technical information on our Trackmaster 152FT. The Trackmaster 228FT is one of our best selling systems, it has become a great success in the window and door industry. The trolleys are rated at 50Kg and run through the 50mm2 228 track. Again greater weights can be taken by using a multiple trolley and load bar arrangement. The track itself is made from high-quality steel, rolled to form 51mm squares, a 3mm wall thickness and a 9mm slot. Floor and roof supports are provided to support the structure of the conveyor system. 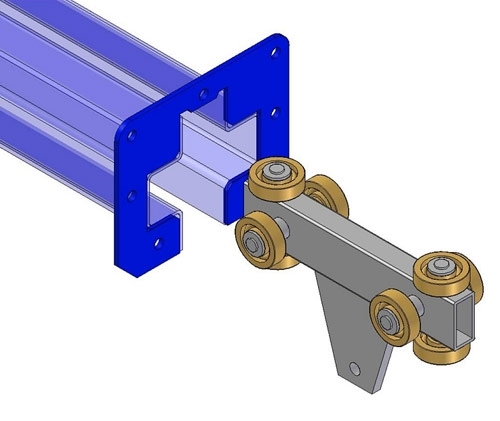 The tension device is spring loaded and would be fitted to ensure correct chain tension There are varying finishes on your Trackmaster 228Ft from getting the track galvanised, steelwork can be finished in a mid blue paint and machined parts self-colour. Click here to download technical information regarding our Trackmaster 228FT. The Trackmaster 406FT is the heavyweight of the free track systems, taking loads of up to 1000Kg. It consists of an 8 wheeled trolley running through a 406 track. The track section is fabricated from dual top hat sections at maximum 3m lengths with bridge plates incorporated every 750mm. Single trolleys are rated 250Kg but greater weights over more trolleys are achievable as before. Track switches will allow you to divert loads to multiple lines and are available for both the left and right-hand side, pneumatic or manual control. We also manufacture and provide turntables to change your load bar direction, whether you need a single turntable or a double turntable. This unit aids the loading and unloading of products, particularly heavy items, which is an important Health & Safety consideration. Click here to download technical information about our Trackmaster 406FT. We understand that all warehouses and factories have different needs which is why we manufacture and supply multiple types of carriers. 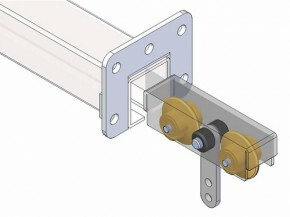 These can be applied to various different trolley types or load bars. We offer manual rotators, indexers and sprocket rotators, which are all available for your specific needs. Our steelwork can be provided in various different heights and sizing, depending on your company needs. Alternatively, it is possible to support your conveyor system from a roof if structurally sound and meets construction demands. Here at Midland Handling Equipment would be happy to survey your factory and quote.